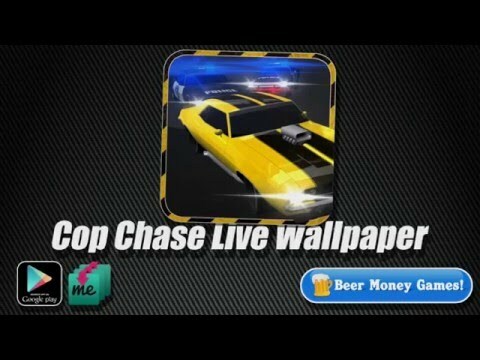 An intense cop chase on your phone or tablet background! This live wallpaper will amaze and entertain you and your friends! Watch as 2 cop cars and 1 run away vehicle speed though this night city setting. This app has several settings that allow you to customize your background. You can select one of four chase cars as well as select a custom color for each one. The app also comes with performance settings that let you change the visual quality of the program as well as controlling the frame rate to deduce battery usage. This is a brand new app and we will be adding more features soon. Please leave feedback and suggestions in the review area so we can improve this app!